When reflecting about the link between research and public policies, academics and practitioners usually refer to two key actors of this relationship: the researchers and the policy makers. While there is some clarity on the characteristics of the former, we believe that those who aspire to inform decision making with research and evidence should avoid talking generically about ‘policy makers’. Or at least we should be aware of the diversity of profiles that coexist under this denomination and adjust our ways to engage with them accordingly. In fact, according to their profiles the type and format of knowledge they need/request will vary significantly. Under Politics & Ideas’ online course “Leaders of change: developing Latin American policymakers´capacity to promote the use of knowledge in policy” we conducted a first effort to identify, on the one hand, information needs according to decision levels, and on the other hand, we also delved into the different decision making styles. What information for each decision making level? The needs for information of public-sector officials shall vary based on their hierarchical position within the sector. Papadópulos (2013, in Spanish) distinguishes three levels of management: political, strategic and operating actors. While political actors make decisions on the global orientation of a certain policy, strategic actors are responsible for the political design and operating mangers are those in charge of all policy implementation actions. Within these three levels, the needs for knowledge vary. Political actors work in a world of ideas and policy models and their involvement in policy making is not daily. Their involvement is more intense during periods of innovation or policy change. Moreover, a second distinction might be done under political actors: those with a clear electoral nature (who actively compete for position in the elections), and those who are nominated to political position by other politicians with higher authority within the party. 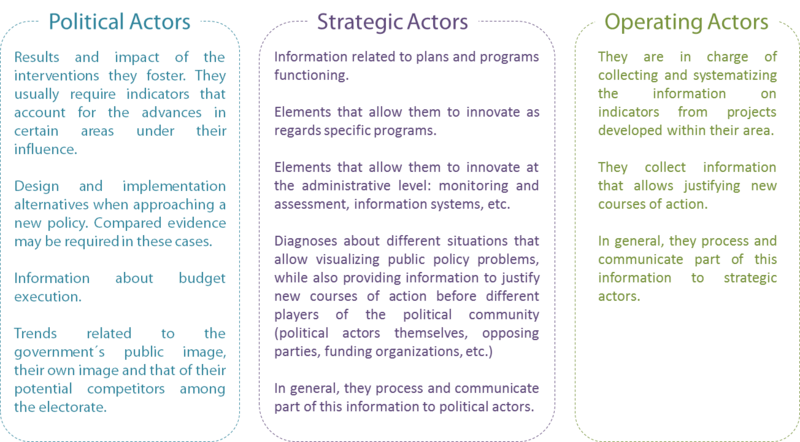 Strategic actors, in turn, are engaged in a more day-to-day basis and their intervention is more intense during the implementation of new policies which require process innovation as well as the creation of specific programs. These actors’ type of knowledge is related to the innovation in administrative processes, the design of information systems, high management systems and assessment and monitoring processes and strategies. 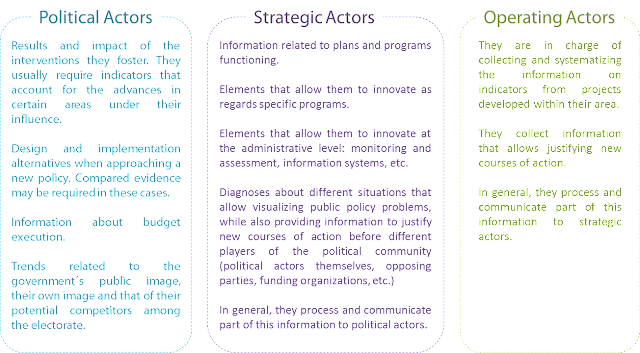 Finally, operating actors have a daily participation and they usually process the actions designed by political actors and, mainly, by strategic actors. Their needs for knowledge vary according to their place in the policy making and implementation process. Naturally, this distinction made by Papadópulos of the roles within the state structure and the need for knowledge obviously varies from one country to another -even from an administration to another or from one situation to another. The involvement of the different types of actors in the different instances of a public policy shall also depend on their profile, education, experience in the public sector and political interest. However, the distinction can still be useful when thinking about the practice itself in the public sector and to visualize the different combinations that actually occur. What follows are some concrete examples that enable us to better understand what information may be useful according to the decision making level. Vocation for the public good. At times, the position they occupy is aligned with their abilities and interests. But many times they are assigned to a position in which they have no expertise. Public image. Many politicians seek to make visible their intervention in the policy process, especially those who are candidates in elections. Reputation among peers or the party. These politicians seek to find a suitable position within their party or in cabinets. They usually perform “behind closed doors” rather than seeking a high profile in the public life. Accumulation of power. All politicians seek political capital to expand their ability to influence government decisions. This ambition can be very large or marginal, but it is always present. Personal enrichment. Some politicians respond to economic incentives or seek private gain. This is not trivial, as many public policy decisions are made based on those interests. In most cases, political actors combine many of these motivations, some being more marked than others. How does the politician invest his/her time? That is, recognize his/her political priorities reflected in the use of his/her time. To whom is the politican accountable? Who appointed him/her in the position? Who is his/her direct boss? Does he/she respond to the party’s interests? How much freedom of action does he/she have? What is his/her mental frame? What ideological preferences and life experience does he/she bring to his/her work as a political actor? How receptive is he/she to the technical aspects of public policies? How much does she/he know about the issue in question? This will help researchers understand why a particular decision choice might be better than another. For instance, if the politician has had experience working in an NGO, he/she might be interested in broadening participation in decision making. What is his/her immediate environment? Does he/she surround him/herself with advisors, family or friends in order to make decisions? To which external players does he/she usually listen to or assign legitimacy? What are his/her incentives ahead? Here researchers must consider the electoral calendar, the timing for budget debate, the legislative calendar, among other things. At what stage of the decision is he/she standing? Is it a decision to be made? Or is it a decision that has been already made? What plans does he/she have for his/her career in the short, medium and long term? Specialized literature provides us with several classifications for decision-making styles, which are often based on the private sector situation and not so much on the public sector. But having a sense of typical decision making styles shall be useful to recognize decision-making profiles within the different areas of work. In this direction, Brousseau shares a classification based on two aspects: the amount of information used when making a decision and the number of alternatives created before making a decision. Regarding the use of information, some prefer to weight large amounts of data and evidence before making any decision. In management literature, those persons are called “maximizers”: they do not rest until they are certain they have found the best possible answer. Benchmarking is a typical exercise suggested by these decision makers. The result is a well-informed decision but it may entail a cost in terms of time and efficiency. Other decision makers only look for key data and are able to quickly produce hypotheses and put them to the test as they go. In this case, literature calls them “satisfiers”: they are ready to act as soon as they have enough information to satisfy their requirements. Tells the story that Bill Clinton, former US President, decided what course the country should take to face the Tequila crisis of 1994 in only 5 minutes in an office with his closest advisers, after they presented the situation and the available courses of action. As regards to alternative generation, those who make decisions with a “sole focus” firmly believe in taking a single course of action, while their counterparts with “multiple focuses” generate lists of possible alternatives and may take several courses of action at the same time. People with a sole focus concentrate their energy in making things turn out the way they think they should; those who resort to multiple focuses would rather adapt to the circumstances. This could be a main difference between politicians and technocrats in their approach to decisions making. In general, technocratic profiles seek to put all possible alternatives on the table, with its costs and benefits. On the contrary, politicians would rapidly choose one way (and hide others) according to their interests. Let’s see this through a simple example: if a politician wants to promote public policy to lower levels of obesity in the population, he/she could consider three alternatives: to encourage people to exercise, to encourage them to change their eating habits or to promote the use of medicine. But if in the community where the politician has influence there is no place to exercise, this alternative will not be considered (will be invisible), and the other two remain as the possible ways. Besides classifying decision makers according to the amount of information they request, it is also possible to recognize decision-making styles that are more participative or collective, while others are more unilateral (i.e. : they want their team to collect data, to point some alternatives and let them decide which is the best). Typically, the first ones tend to provide more space when exchanging information, ideas and insights about a given situation (i.e. : they set up regular team meetings, invite other colleagues to bring their perspectives on a certain issue, etc), although often this process is affected by the urgency with which decisions need to be made, and thus they prefer to resort to unilateral decisions and to their own insight and knowledge to act. To sum up, there are clearly no cookie-cutters to engage with policymakers effectively. On the contrary, strategic communications of our research and ideas requires that we thoroughly think about the needs, the roles, the incentives and the decision-making styles of the most relevant policymakers and consequently select from our evidence and proposals, those that will be more relevant and appropriate to each- and then begin to identify when to communicate it, in which formats, spaces, etc. Probably a high but worthy investment if we aim at making our research of value and use in the policy realm.